The carrot (Daucus carota L.) is an annual or biennial herb with a thick fleshy taproot, which is the primary organ of agricultural importance. Carrot roots are usually orange, but there are also white, black, yellow, red and purple varieties. The roots range in length from 5 cm to more than 50 cm and are generally conical. However, there is tremendous diversity in root shapes and sizes. The leaves are alternate and compound and organized as a rosette. Carrot roots are an important food product. Depending on the variety, carrots are sold fresh or processed: pre-packed, boiled and canned, frozen, diced and sliced, etc. (Bradeen et al., 2007). There is a long tradition of feeding carrots to livestock but their use in animal feeding is marginal nowadays. Feed carrots are usually cull (grade-out) or surplus carrots obtained during periods of overproduction. They are typically fed fresh and are available whole or chopped, unwashed or washed (Morel d'Arleux, 1990). Carrots can also be ensiled. Dehydrated carrots are popular treats for horses and pets. Other carrot products that are occasionally fed to livestock include the tops resulting from harvesting, and various by-products of carrot processing (juice, aromas). It has been suggested that the carrot originated in Afghanistan and later spread westwards (southern and north-western Europe) and eastwards (Asia Minor, China, Japan). It is now found in Europe, south-western Asia, Africa, and America. Carrots cultivated in north-western Europe were all purple or yellow with long roots until modern orange cultivars (containing carotenoids rather than anthocyanins) were developed in the Netherlands in the 17th century (Vaughan et al., 2009). China is by far the main producer, with 47% of the 33.7 million t carrots and turnips produced worldwide in 2010. The USA and the Russian Federation come next, with only 4% of the production each (FAO, 2011). Most of the production is done in cold or temperate areas, and little effort has been dedicated to developing cultivars for tropical and subtropical areas (Bradeen et al., 2007). However, some varieties can be grown at all altitudes in the tropics (Göhl, 1982). Carrots are seasonally available in areas that produce carrots for human consumption (Goby et al., 2008). In temperate climates, they can be used as a winter feed. Due to the weight and bulk of carrots, their transportation is expensive and losses during handling and storage incur additional costs (Morel d'Arleux, 1990). Carrot roots can be fed fresh, ensiled or dehydrated. In temperate countries, washed grade-out carrots, whole or not, can be stored in a 1.5 m high pile for up to 10 days. Whole, unwashed carrots can be stored up for 20 days. Dry, unwashed surplus carrots can be kept in 1.2 m piles covered with straw for more than a month in cool weather (Morel d'Arleux, 1990). Carrots can be ensiled, typically with a dry forage (hay or straw), chopped at 7-8 cm length (Morel d'Arleux, 1990). They can be ensiled in layers with grass and alfalfa (Jubert, 1980). Ensiling carrot roots and whole carrot plants was shown to decrease the β-carotene content by 34% during storage. Moisture, volatility of nitrogen and butyric acid increased, although the pH value was kept below 4.2 (Nonaka et al., 1994). In a comparison of different mixtures of carrot silage with grain and straw, the best quality silage was obtained with carrot and oat grain. Carrots were also able to stabilize the moisture content of low-moisture late-harvested maize (Nonaka et al., 1994). Carrots are fragile vegetables and their production can be wasteful. In France, for instance, more than half of the carrots produced for canning are discarded. Using grade-out and surplus carrots in animal feeding may reduce the environmental cost associated with their disposal (Goby et al., 2008). Fresh carrot roots have a high water content (about 88%) and are therefore a refreshing feed. However, animals consuming large amounts of carrots may consume less dry matter, resulting in a decreased nutrient and energy intake (Wolter, 1999). The dry matter contains up to 60% sugars, mostly sucrose, which makes carrots both highly digestible and palatable (Alabran et al., 1973). Terpenes also contribute (positively and negatively) to palatability (Simon et al., 1980). Because of their high carbohydrate content, carrots can be considered as an energy feed. Protein content is low (4-12% DM) and they contain moderate amounts of fibre (less than 10% ADF). Like other roots and tubers, they may contain high levels of mineral matter (more than 10%) due to residual dirt and it is, therefore, preferable to wash them before feeding (Wolter, 1999). An important benefit of carrot roots is their high carotenoid content, and particularly ß-carotene, a precursor of vitamin A (retinol), involved in the eye function, reproduction, growth and the maintenance of skin and mucous membranes. Carotene content depends on the carrot variety: orange types contain mostly α- and ß-carotene but purple, red and yellow carrots have a different carotenoid composition (Hammershøj et al., 2010). 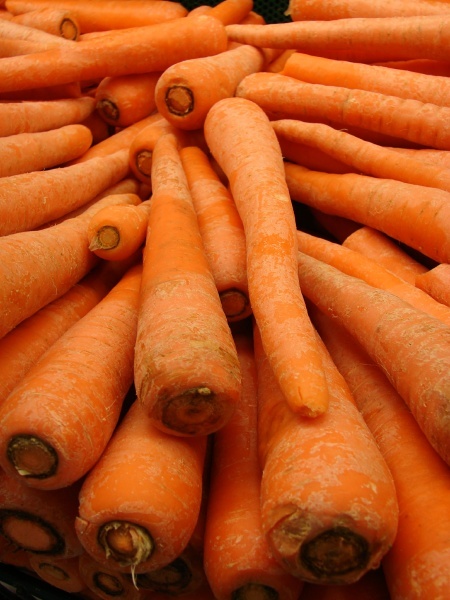 Raw orange carrots contain 200-1000 mg/kg (DM) of ß-carotene (ANSES, 2008). ß-carotene is located in the chromoplasts as crystals and stabilized by lipoproteins, and its stability is rather high (Frias et al., 2010). However, processes like ensiling and drying can significantly decrease the ß-carotene content (Nonaka et al., 1994; Frias et al., 2010). The autocatalytic oxidation of ß-carotene may be caused by the reduction of moisture content during the dehydration process. However, certain drying processes are less destructive than others (Frias et al., 2010). For herbivores, the ß-carotene content of carrots makes them particularly valuable when hay and straw are the only other feeds (Fuller, 2004). Carrots have also been tested as a natural source of pigments in animal productions where product colour is important, such as poultry egg production, fish and crustaceans. Carrots are particularly rich in vitamin C (ascorbic acid) and contain about 300-700 mg/kg DM of this vitamin (ANSES, 2008). However, as vitamin C is highly heat-labile, it is very susceptible to dehydration (Frias et al., 2010). Carrot tops contain about 11-12% protein in the DM, 17% crude fibre and up to 18% ash, depending on the amount of residual dirt. Carrot juice residue has a relatively low protein content (7.7% DM) and a high amount of fibre (ADF 28% DM) (Enishi et al., 2004). Carrots contain large amounts of fermentable sugars that may cause acidosis (see Ruminants below). Frozen carrots will rot in 7-8 days and are poorly palatable (Morel d'Arleux, 1990). Feeding high levels of fresh carrots may cause some scouring which can be minimized by storage for a few weeks (Rust et al., 2008). Carrots are quite palatable and readily consumed by cattle. With an energy value only slightly lower than that of maize grain (on DM basis), carrots can be used as an energy source (Rust et al., 2008). Dairy cows and young bulls may be fed up to 25 kg and 20 kg fresh carrots a day respectively (Morel d'Arleux, 1990). Steers could be fed up to 40% of the diet DM as carrots without deleterious effects (Rust et al., 2008). Due to their high content of fermentable sugars, fresh carrots should be combined with fibrous feeds to prevent acidosis, and should be introduced progressively in the diet (8-10 days). The mixture of carrots and concentrate feed should not exceed 50% of the diet DM and ad libitum consumption must be prevented (Morel d'Arleux, 1990). In dairy cows, most trials involving carrots have studied the effects of ß-carotene on milk composition and reproductive performance. Prolonged use of carrots in the diets of dairy cows increases the caroten content of the milk, producing a yellow colour in the milk fat (Fuller, 2004). Butter with an elevated carotene content and an optimum iodine value can be produced by feeding dairy cows with 10 kg/d of rapeseed and carrots. As only low amounts of highly unsaturated fat were added to the diet, no problems connected with rumen digestion were encountered. This feeding strategy shows a practicable way of producing high-quality butter in moderate climates independent from seasonal variations (Schreiner et al., 2006). Supplementation of dairy cows with 5 kg/d of fresh carrots during the winter feeding period increased the content of vitamin A in milk (Nalecz-Tarwacka et al., 2003). In dairy cows fed carrot silage, the ß-carotene levels in blood plasma and milk increased greatly (Nonaka et al., 1994). In an earlier trial, the replacement of 10 kg of fodder beets by the same amount of carrots resulted in a 43% increase in milk carotene. This effect was maintained after replacement of the carrots by sugar beet. Milk protein and milk fat were not affected by the substitutions (Maschkin, 1982). Feeding high-yielding cows with a diet containing 10 kg of fresh carrots resulted in a significant improvement in reproductive performance: a decrease in the interval between calving and the first successful insemination (from 167-185 days to 110-171 days) and a decrease in the number of inseminations necessary for conception (from 1.8-2.7 to 1.0-1.8), thus increasing the calving rate (from 84.5 to 92%). Dairy performance (yield and fat content) was unchanged (Car, 1985). Prolonged use of carrots in the diets of beef cattle may give a yellow colour to the carcass fat (Fuller, 2004). Ensiling culled carrots with hay was found to produce a high-quality stored feed for the wintering of growing cattle. Carrots and grass hay were ensiled together, stored in vertical silos, and compared to a bromegrass/alfalfa silage in a feeding trial using steers: the carrot/grass silage ensiled well and was accepted by the steers, and growth performance was similar for both silages (Laflamme, 1992). Carrots are a good feed for ewes and can be used similarly to fodder beet. Fresh carrots fed at 27% of the DMI (3.3 kg/d during the last month of gestation and 5 kg/d during lactation) were well accepted by gestating and lactating ewes. It was also possible to increase the inclusion level up to 80% in ewes at maintenance. However, dietary protein should be monitored (Molénat et al., 1999). Goats can be fed up to 2-4 kg/d of fresh carrots (Morel d'Arleux, 1990; Weidman, 2010). 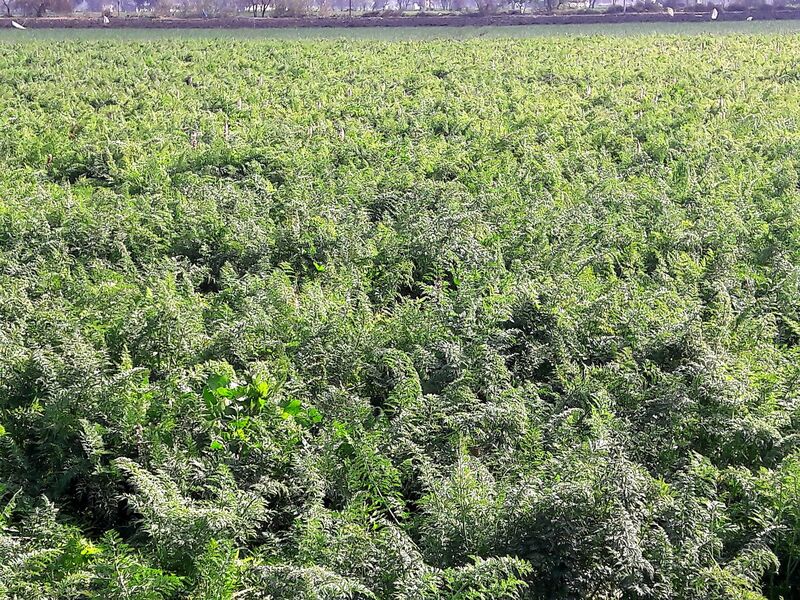 In Egypt, carrot top hay replacing 50% of berseem hay in the diet of Rahmani sheep generally increased nutrient digestibility (Bassiouni et al., 1999). Carrot juice residue was found to have potential as a ruminant feed with an ME value of 14.1 MJ/kg DM and a crude protein content and DM rumen disappearance higher than those of beet pulp (Enishi et al., 2004). Carrots used to be a popular feed for pigs before pig farming became industrialised. Boiled carrots were mentioned as the best pig feed in an early growth trial in England in 1770 (Hertrampf, 1998). Today, information about feeding carrots to pigs is scarce. The energy digestibility of carrots in growing pigs is high (83%) though lower than that of sugar beet roots (Jentsch et al., 1989). Growing pigs can eat up to 1.5 kg fresh carrots a day (Göhl, 1982). Carrot powder (boiled, dehydrated and grinded carrots) has been tested successfully in the prophylaxis of diarrhea of weaners (Jugl et al., 2001). Several tests have been carried out in Russia using mixed silage of roots (carrots, beets), tubers (potatoes), fruits (squash, pumpkins) and fibre sources (maize cobs or cereal wastes). A silage containing 17% carrots (with fodder beet, sugar beet and potatoes) fed to replacement sows had a positive effect on live-weight gain, on many reproductive parameters (including litter size, milk yield, piglet weight, and piglet survival rates) and on litter performance. Similar results were obtained on lactating and gestating sows fed a silage containing 12% carrots (with pumpkins and potatoes) (Yushkova et al., 2010). In an earlier experiment, feeding lactating or gestating sows a diet containing silage with 10% carrots and squash affected litter size but not fertility (Moshkutelo et al., 1988). There is limited information on the use of carrots in poultry. Carrot roots and tops can provide carotenoids to laying hens. In Denmark, carrots have become common as forage in organic egg production. In organic laying hens fed a diet supplemented with 70g/d of orange, yellow or purple carrots, a decrease in certain performance parameters (egg and yolk weight for all carrot colours, egg mass for orange carrots) but increased yolk colour parameters and carotenoid content was noted. Purple carrots were beneficial for egg laying rate and egg and yolk mass production (Hammershøj et al., 2006; Hammershøj et al., 2010). Giving egg-laying hens access to maize silage, barley-pea silage and carrots as foraging materials decreased pecking behaviour, thus improving animal welfare (Steenfeldt et al., 2007). Dried carrot meal included at 8% in the diet of laying hens significantly improved yolk colour when compared with a wheat-based control diet. This improvement was similar to that obtained with a yellow maize-based diet. Carrots at 4% inclusion level also improved yolk colour score. Body weight gain, egg production and feed conversion were not significantly affected (Sikder et al., 1988). Carrot tops fed at 15% to laying hens improved the ß-carotene content and the colour score of egg yolk. This increase was obtained at 5% inclusion rate and did not affect egg weight, Haugh unit, egg-shape index, and strength and thickness of eggshell (Ishikawa et al., 1999; Ishikawa et al., 2001). Even though carrots are commonly associated with rabbits in popular culture, their use in commercial rabbit production is uncommon. However, they are useful feeds for pet rabbits. Due to their high sugar content, the amount given should be limited. They should never be fed frozen or thawed, mouldy or rotten (Lowe, 2010). Whole carrot plants (roots and tops) dehydrated at a low temperature (35°C) were found to be a good source of nutrients (65% protein digestibility) for the growing rabbit though its digestible energy content was moderate (DE 10.1 MJ/kg DM) due to its high mineral content (24% DM). Even at a high inclusion rate (30%), whole carrot plants did not produce adverse effects on animal growth, feed intake, or health. Removing the residual dirt would improve their nutritive value (Goby et al., 2008). Carrot tops can be included up to 20-30% in diets for growing rabbits. In rabbit diets based on berseem (Trifolium alexandrinum) hay, partial substitution with carrot tops (20%) gave the highest growth performance and best feed conversion (Eleraky, 1996). Carrot tops replaced up to 75% of soybean meal in growing rabbits diets, resulting in higher nutrient digestibility, live weight and feed conversion efficiency (Magouze et al., 1998). Higher inclusion rates gave less satisfying results. Carrot tops replacing 67 to 100% of clover hay in the diet of growing rabbits was detrimental to nutrient digestibility, live weight, live-weight gain, carcass characteristics and meat protein and fat content (Ibrahim, 2000). Increasing the inclusion level of carrot tops in the diet of growing rabbits up to 60% of the DM depressed nutrient digestibility, N-retention, daily gain and feed conversion ratio (El-Kerdawy et al., 1992). 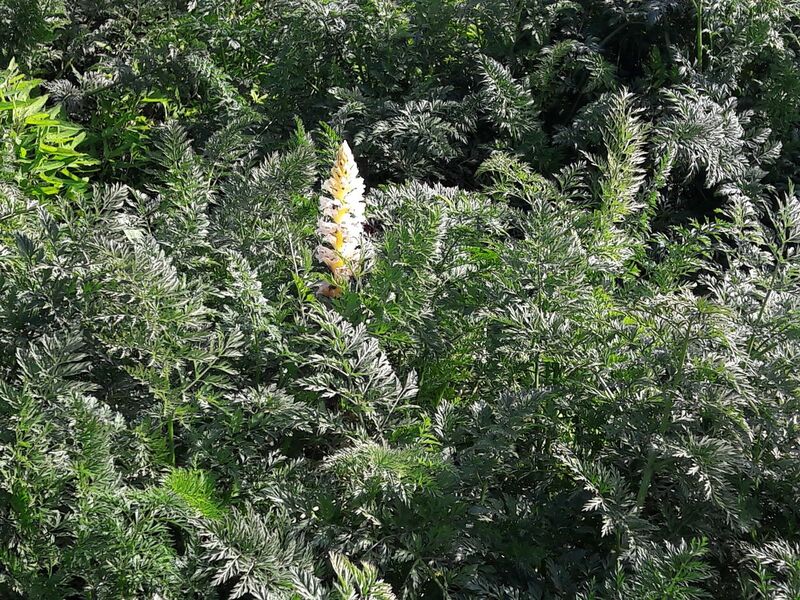 Carrot tops could also substitute for up to 75% of soybean meal in commercial diets for does and bucks without any negative effects on reproductive performance (Mahmoud et al., 1998). 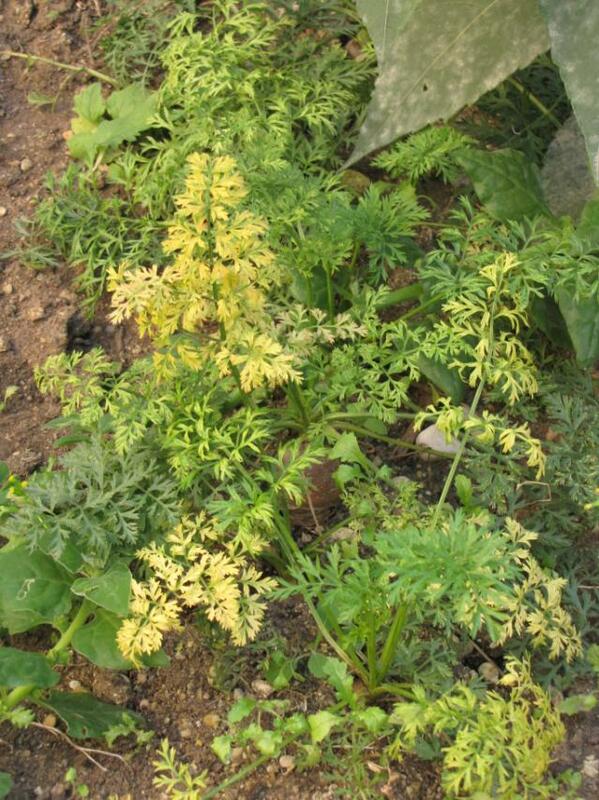 Carrot plants do not seem to be palatable to wild rabbits (Gidenne, 2010). Dried carrot waste can be used up to 50% in growing rabbits diets in place of conventional ingredients without any adverse effects on the productive performance, nutrient digestibility, blood components and economical efficiency (El-Medany et al., 2008). Carrots have been a popular horse feed for centuries and some varieties used to be known as "horse carrots" (Pferdemöhren) in Germany (Becker et al., 1969). In the 19th century, carrots were a usual part of the diet of French military horses and substitution coefficients for oats, hay and straw had been calculated (Dechambre et al., 1903). Today, carrots are still a staple of horse diets, for example in the UK, Italy, France and Australia. Horse feeding guides usually mention carrots as treats and appetizers (Harris, 1999; Wolter, 1999; Bergero et al., 1991; Kohnke et al., 1999). Dehydrated carrots and carrot flakes are common commercial treats for horses. Fresh carrots are used in low amounts (2-3 kg/d) for working horses, mostly to maintain appetite and facilitate the consumption of dry feeds. Clean and well-preserved carrots can be fed up to 10 kg/d to resting or convalescent horses. Higher quantities up to 20-25 kg/day are not detrimental to health but can have a laxative effect and may reduce feed intake (Wolter, 1999). They should be chopped into rings of no more than 5 mm before feeding to reduce the risk of choking (Kohnke et al., 1999). Other guides recommend slicing the carrots into long thin slivers (Vogel, 2011). Using carrots as a source of natural pigments has been tested in several fish species with variable results. Gilthead sea breams (Sparus aurata) fed a diet containing carrots providing 40 mg/kg of total pigments could not effectively absorb carrot carotenoids (Wassef et al., 2010). In cichlid fish (Cichlasoma severum) fed a diet containing carrots providing 50 mg/kg of total pigments, the coloration of the fish was positively affected without detrimental effects on feed conversion or growth rates (Kop et al., 2010). The pigmentation of freshwater prawns (Macrobrachium rosenbergii) fed a diet containing 10% frozen carrot tops was enhanced with no significant differences in final mean weight, yield and survival (Garces et al., 1993). Farmed giant African land snails Achatina fulica fed sliced carrots, cucumbers, apples and fresh lettuce leaves together with a compound snail feed grew faster than snails fed the vegetables or the compound feed alone (Monney, 1994). Many dehydrated, freeze-dried, flaked, etc. carrot-based dog treats are available from petfood vendors.